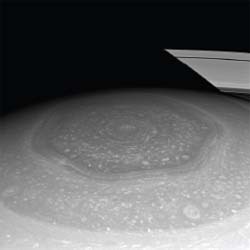 Why is there a giant hexagon at the north pole of Saturn? In the 1980s NASA’s Voyager spacecraft observed strange cloud formations near Saturn’s north pole that looked like pieces of a giant six-sided figure. In the decades since, this huge hexagonal cloud formation has persisted, and the Cassini spacecraft mapped it in detail. The hexagon is about twice the diameter of Earth—and although it has formed completely naturally, it looks eerily artificial. Astronomers are studying this mysterious formation very carefully, and they think that it might be caused by a high-speed jet stream moving within Saturn’s dynamic atmosphere.